A tooth is made up from different parts, including the visible crown and the root, which extends into the bone of the jaw. At the centre of the tooth is a soft area called the dental pulp. The dental pulp is connected to the root canals of the tooth, which are the “legs” of the tooth that extend down into the root. The root canals are where the nerves of the tooth are connected and contain blood vessels and connective tissue that nourishes the tooth. At Perfect Smile, our root canal treatments are designed to repair and save a tooth that is badly decayed or infected. A root canal treatment involves drilling a hole into the infected tooth to remove the infected pulp and nerves from the tooth. 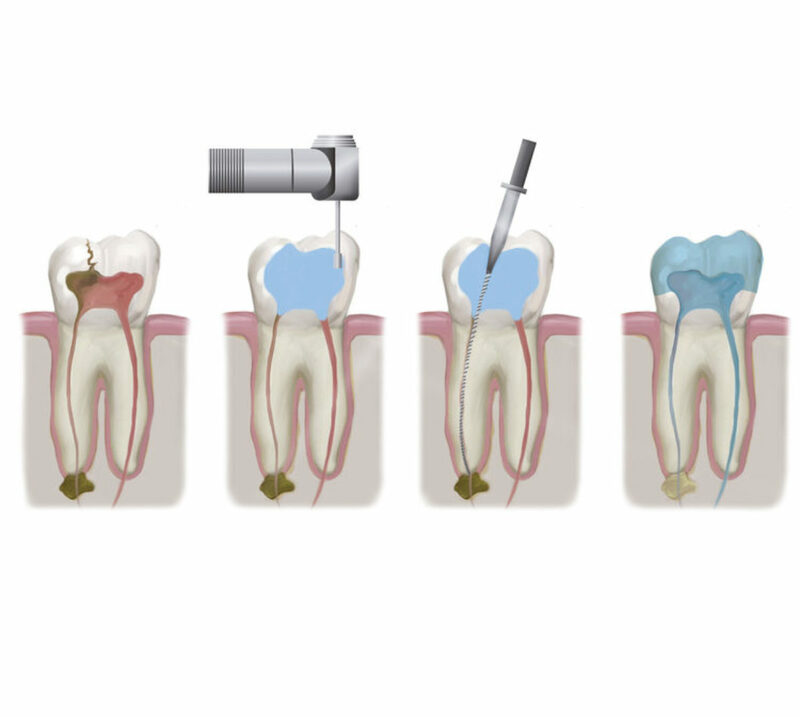 Once the root canal is cleared from bacteria, it is then sealed to prevent further damage. Over 90% of root canal treatments are successful and save the tooth for years or even a lifetime after the treatment. The root canal procedure may require one or more dental visits and can be performed by a dentist or a Specialist Endodontist. An Endodontist is a dentist who specializes in the causes, diagnosis, prevention and treatment of diseases and injuries of the human dental pulp or the nerve of the tooth. The choice of which type of dentist to use depends to some degree on the root canal procedure needed in your particular tooth and the general dentists’ comfort level in working on your tooth. Your dentist will discuss who would be the best-suited to perform work in your particular case. Overall, our root canal treatment will save your tooth from a serious infection that can destroy your teeth. After a root canal, your tooth will be able to be used to eat, drink, talk and live your life as normal for years to come. The pulp or pulp chamber is the soft area within the centre to the tooth. The tooth’s nerve lies within root canals, which lie within the roots or “legs” of the tooth. The root canals travel from the tip of the tooth’s root into the pulp chamber, which also contains blood vessels and connective tissue that nourishes the tooth. A tooth’s nerve is not vitally important to a tooth’s health and function after the tooth has emerged through the gums. Its only function is sensory – to provide the sensation of hot or cold. The presence or absence of a nerve will not affect the day to day functioning of the tooth.